WOW! That's a brilliant word to describe this movie. Set during World War II, the story is seen through the eyes of an 8 year old boy, Bruno whose father is the commander of a nearby concentration camp. A story of a forbidden friendship between two children who are divided by war. I loved how the innocence of children shines through in this movie. 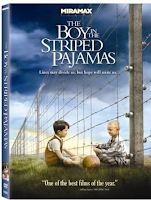 Children only learn what they are taught, and when Bruno is taught that he is supposed to despise Jews, he is confused when he finds out that his new friend at "the farm" behind the fence, Shmuel is Jewish it confuses him even further. This is a powerful, heart wrenching movie that I would highly recommend. You'll finish this one with a new sense of respect for the innocence of a child. We can learn a lot from them! Happy Go Lucky is about an over the top, happy optimist named Poppy. She has to be the most bright, sunny characters that have even been presented in a film. Poppy was not my favorite character because she is at the opposite end of the spectrum from my character. I found the driving instructor to be rather funny, myself. For, I truly believe that he would probably be the most real life-like character. If you haven't seen this one, I don't know that I would recommend it to you. I really couldn't wait for it to be over. It's just not my cup of tea. Happy Go Lucky was a little bit out of the realm of reality, in my opinion. It had a few moments, but overall I'd say that I wouldn't want to watch it again. On a side note, I did think that Sally Hawkins, the actress who played Poppy reminded me a bit of Sandra Bullock. Thanks for the reviews. I'm putting Boy in Striped Pajamas on my list. I was going to take my son to see that first movie; he is fascinated by what life was like for the Jews in the ghettos in WWII. I'll have to get the DVD from Netflix now.